Love and Blessings from Moussa of Albaka Creations! Click on this artist's picture to see more work by this talented traditional craftsman who is part of a tradition passed down from father to son for many generations. Acclaimed Tuareg silversmith Moussa Albaka was awarded the prestigious U.N.E.S.C.O. Seal of Excellence as well as having his jewelry exhibited at the Smithsonian. A Tuareg tribesman from Niger, in West Africa, for many generations his family, of the Inadan class, has been involved in silversmithing, as well as camel caravan trading throughout the Sahara. 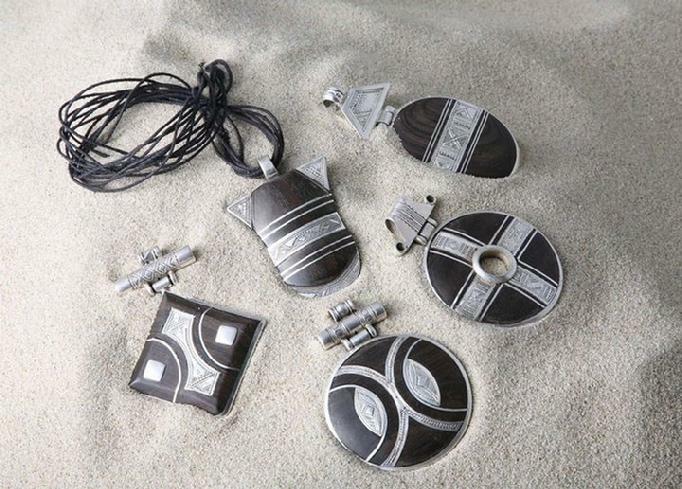 He and the men in his family are highly skilled producers of Tuareg jewelry. Albaka creations include necklaces and amulets, bracelets, earrings, buckles, daggers, and locks, all handmade of 95% silver. The lost wax process is used, and the techniques of decoration are engraving, repoussé, and inlay with semi-precious stones, other metals, and ebony. Many of the designs are traditional, but Moussa has long been creating more modern pieces in his own unique style. Tuareg jewelry is highly valued among the peoples of Africa. Europeans also have developed an appreciation for Tuareg aesthetics. Moussa has collaborated with several well-known designers and has won the UNESCO award for artistic excellence with his work. Since 2000, he has attended fairs and shows all over the U.S. and at present, makes his home in Tucson. In a book about Tuareg society by Dominique Casajus, his family was featured in the text with photographs. At the Center for Scientific Research in Paris, he assisted a poet in translating a book of French poetry into Tamasheq (the language of the Tuareg and Berbers). Houa Albaka, Moussa’s sister, and the other women in his family, make traditional leather camel bags, pouches, purses, belts, boxes, and pillow covers. They are decorated with designs in brightly colored leather which is etched, woven, embroidered, and fringed. Like the silver jewelry, this work is unique to the Tuareg. The Tuareg are popularly known as the “Blue Men of the Sahara” because the indigo dye pounded into their robes and turbans rubs off on their skin. It is tradition for Tuareg men to veil, especially in formal situations, while women do not. Aesthetic beauty through dress and jewelry is valued. The Tuareg live as nomads, herders, farmers, and now, city dwellers, mainly in Niger, Mali, Libya, and Burkina Faso, with Agadez in Niger, as the tribal center. to help preserve the wonders of ancient cultures.